In NAGAWA, it received the towns and villages merger of Heisei 17 years 10 month, we established for the first time to become the fiscal year 1 a "second 18 following NAGAWA long-term comprehensive plan" as Shinmachi. The plan, formulated the fiscal 28 year as the target year, was taking advantage of "1. Town planning to be proud of coexistence with nature," "2. town development full of vitality in the wisdom and ingenuity cheerfully," "3. people and people, the heart bright town development "," 4. residents and the government is defined as the basic goal of one 4 of town development "to create in one piece, has been promoting the town development full of charm along with the townspeople to this. However, this 10 year low birthrate and aging advances along with the decrease of the population, the social situation surrounding those towns, such as companies of low growth due to the economic downturn has changed greatly. Also, is carried out a review of national and local relationship by full-scale flow toward decentralization, more than ever and while the independence and responsibility of local governments is a strong demand, the financial situation of this town to support it has become increasingly severe, in the conventional sense of values ​​and methods have become many issues that can not be handled. For this reason, along with the efforts to enhance the financial and administrative infrastructure, residents more than ever, organizations, and business and government cooperate to address the challenges of the region, it will be that it is necessary and important to promote individuality certain town planning. Furthermore, welcomed 10 year from the merger, town development by taking advantage of local resources and characteristics in a more broad-based perspective is required. Under these circumstances, anticipation of the new era, to develop a "comprehensive plan of a new 10 year" in which all the townspeople living in NAGAWA becomes the guideline for town development to be able to live in cheerful. In NAGAWA, clearly defined the principles and basic principles of self-government, in order to promote the town development of the collaboration by the townspeople autonomy, established the self-government basics regulations as "the best of Conduct (law)" of NAGAWA. Established the Nagato-cho, and Wada village merger was born to Shinmachi of town development of basic policy, developed a plan that is based on this, by the realization, along with the improvement of the establishment and the residents welfare of rapid integrity of both towns and villages, Shinmachi It aims to the balanced development. 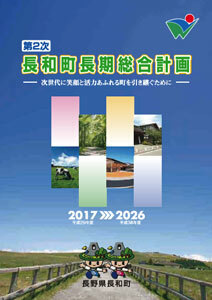 Second NAGAWA long-term comprehensive plan is, "basic concept", consists of the "Basic Plan" and the "implementation plan". In order to comprehensively and systematically manage the town administration, and fiscal 38 year (2026 years) the target year, and to clarify the goals and measures to realize the future of the town over 10 years. "Work" is called the "people", in order to continue to establish a virtuous cycle in which "people" is attract the "work", and re-check the "strengths of shining and sparkling" not only to NAGAWA, take advantage of it to the fullest that is, creation and high employment in the quality of employment, to proceed with the policy that aims to create an environment in which entrepreneurship come true. In the future, we aim to come and go active is "people" more and more "people", in the construction of tourism and exchanges that take advantage of the "gleaming and shining local resources", we will work to increase the alternating current population. And, to proceed with the measures that taking advantage of the resources that has been cultivated in the culture in which the "people" and "people" was Ikika' from time immemorial, attract migrants to NAGAWA. In order to fulfill the hope of the young generation, to be brought up birth to a child with confidence in NAGAWA, to build a system to carry out a detailed support at each stage of pregnancy, childbirth and child-rearing from marriage, to proceed with the town development that want to child-rearing . Satisfied with the life of people in the area who live there, it is important to go to "town" as live safely and with peace of mind, for that, of living foundation for advancing the town development full of vitality that matches the era do the maintenance. In addition, to proceed with the "cooperative town development of the work" of the residents is the leading role of town development. In order to achieve the basic objectives defined in the basic concept, the individual plan of development and maintenance policy of the major measures in each field, and to systematically reveal the specific measures related. On measures shown in the basic plan, intended to clarify the contents and financial resources of each business to specifically implemented, is 3-year plan set forth on the basis of financial planning. For this implementation plan, revised annually by the degree of rolling method, it will be the specific guidelines of the budget and office business executive.